Just as we had put the tent up, we heard the sound of several scooters coming down the path towards us. A group of kids pulled up in a clearing nearby and we could hear them setting up a barbeque and a campfire. More and more people arrived and we realised we were in for a noisy night. 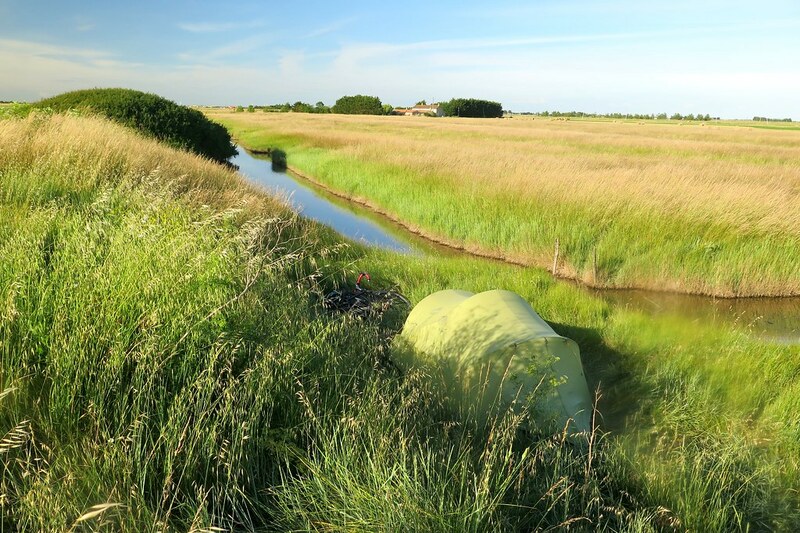 We picked up the tent and carried it a few hundred metres further down the shore, then came back for the bikes and panniers. We watched the sun setting over the lake then went to bed, just as the party was getting going. We slept ok, despite a bit of noise, we were definitely glad to have moved further away. 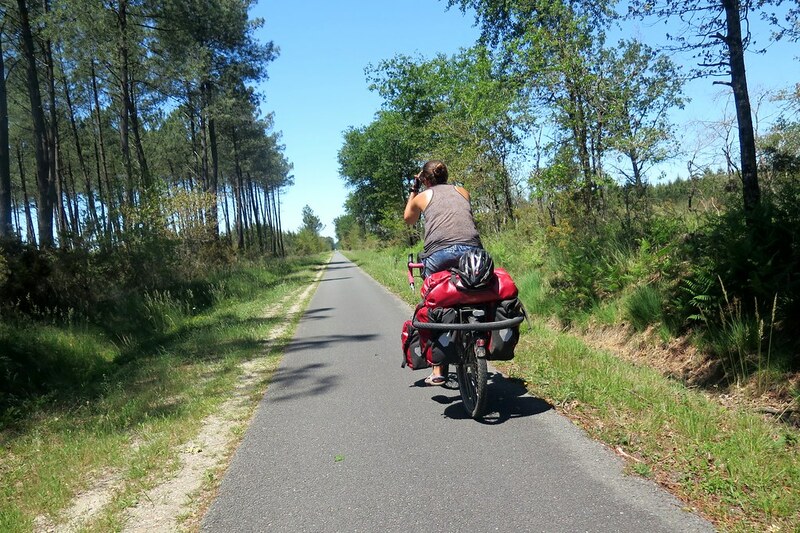 For the coming days we would be following Eurovelo route 1. 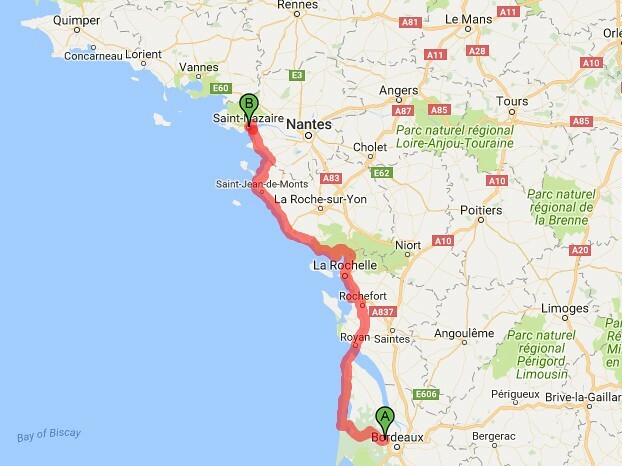 In this area, the French have called the route the ‘Velodyssey’ and it hugs the coastline, staying almost entirely away from the roads. This is good and bad, it means the riding is quite relaxed, but it also takes a very convoluted route with lots of lefts and rights adding a lot more distance than you’d expect from looking at the map. At points the path was just a concrete strip, barely wider than our bikes and very bumpy, especially tricky when we came face to face with cyclists coming the other way. 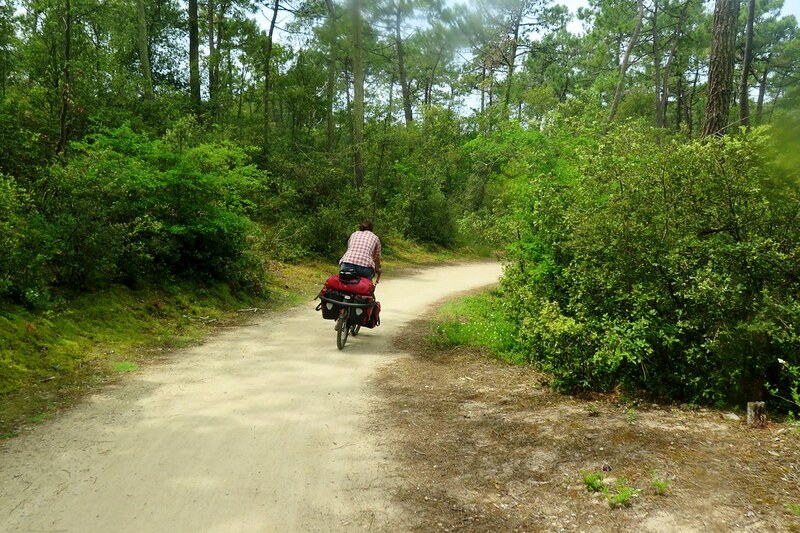 It was very pleasant riding though, through sand dunes and pine forests next to beaches busy with surfers and errr naturists. 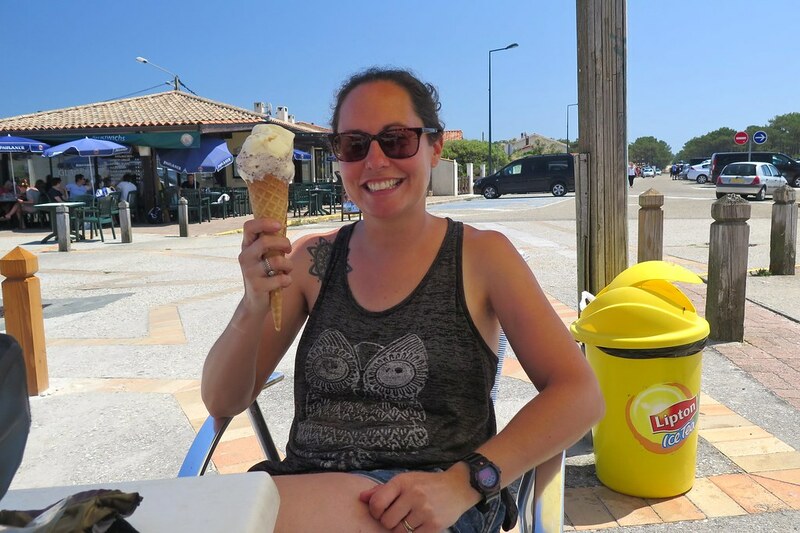 The weather couldn’t have been better, clear blue skies and hot sunshine, meaning we took plenty of water, fruit or ice cream breaks in the shade. 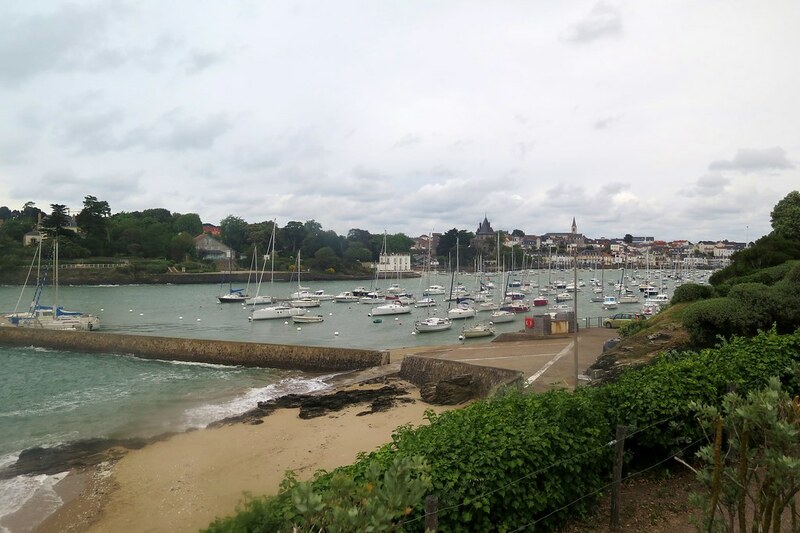 We went through Hourtin, Montalivet and then Soulac, all really nice seaside towns, busy with tourists. 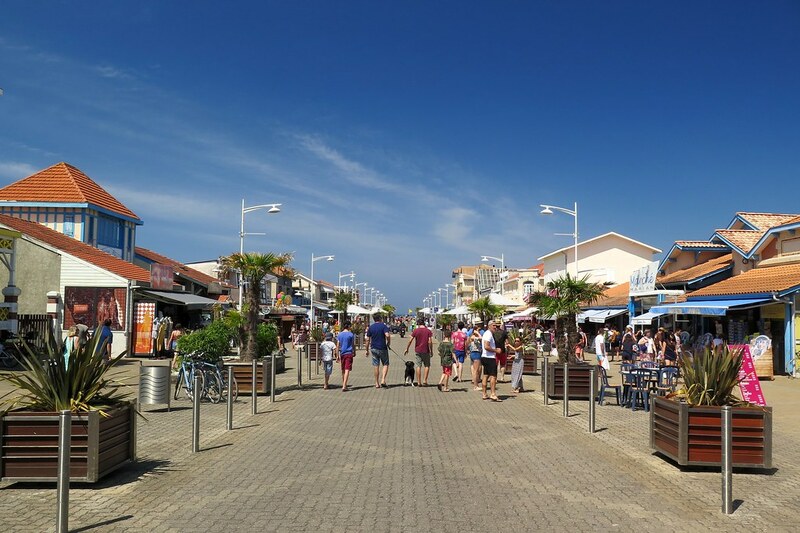 This Atlantic coast has a really good vibe, it seems to be more about the surf and the outdoors rather than the bling and the superyachts on the Med. It hasn’t been the easiest area to find camp spots, as there are so many large holiday park type campsites, (which, with their security gates and high fences, kind of look like minimum security prisons) but the path takes us through lots of pine forests, which usually give us somewhere to hide away and pitch the tent. 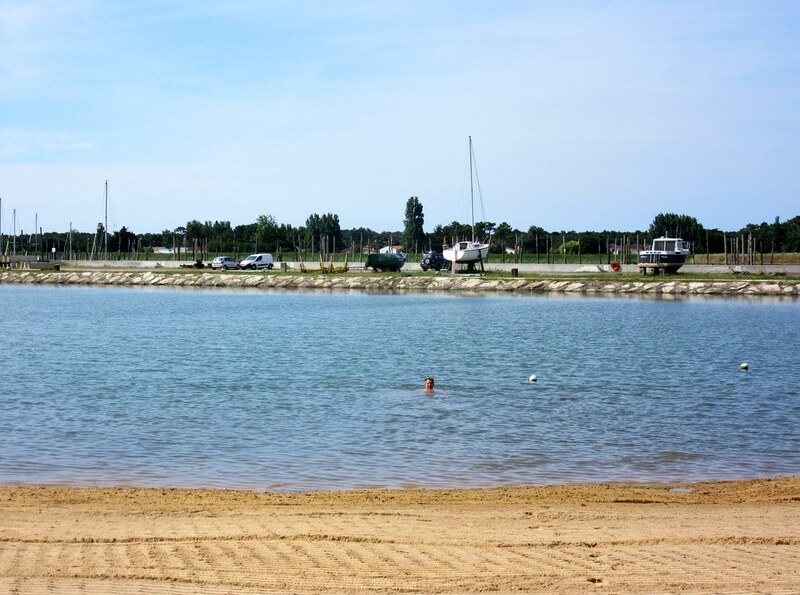 North of Soulac, we reached the Gironde estuary which we crossed on a busy vehicle ferry, taking us to Royan. The weather had been building up and we had a big thunderstorm and some heavy rain in the afternoon. We were heading inland, cutting a corner to rejoin the coast near Rochfort. 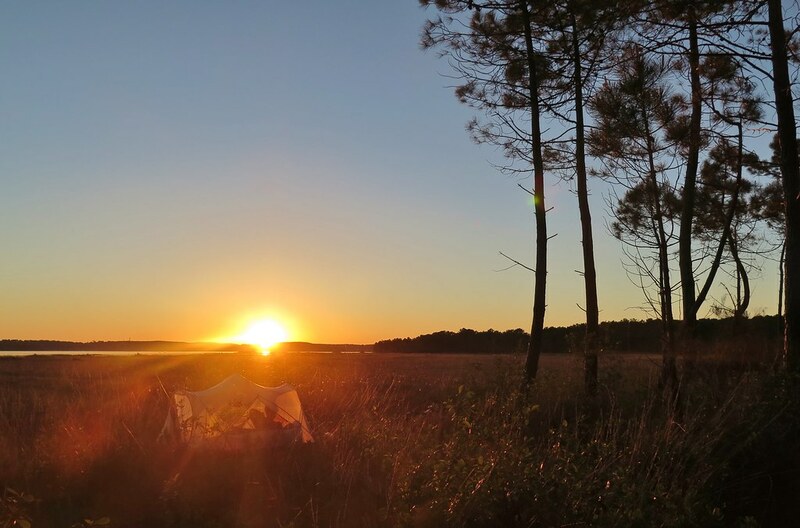 We were able to shelter from the downpours as they came and went, but when we camped that night in the woods, the ground was very wet under us. At Rochfort, we had to cross another river. We hoped we could use the ‘Transbordeur’ bridge, an incredible old machine which carries you over the river on a platform, suspended by cables. Unfortunately, it was closed for renovations and there was a ferry shuttle instead. But the ferry shuttle wasn’t running either – another holiday, or long lunch break, or the driver just couldn’t be bothered, we couldn’t work out which. 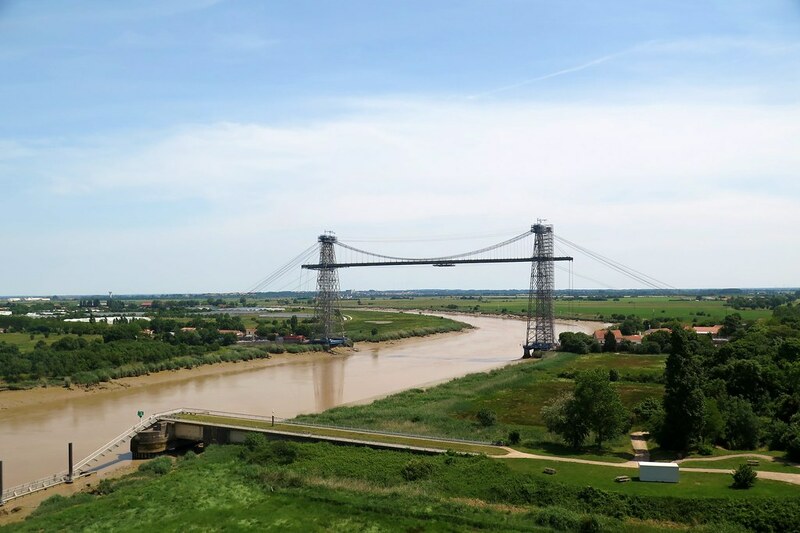 There is a big road bridge, but it didn’t look like bikes would be allowed, and the only alternative was riding another 10km upstream to a smaller bridge. We thought we’d just chance it and take the main road. We were all psyched up to get our heads down and ride fast, ignoring any signs forbidding us from crossing, but once we got to it, there was a cycle lane anyway! The 29th is our wedding anniversary, celebrating our 9th year of marriage. It’s been a good one, I don’t think we’ve spent longer than an hour or so apart all year. I think we’re pretty lucky to have a relationship where we enjoy each other’s company that much, especially through some of the intense situations that a cycle tour throws at us. We treated ourselves to a fancy room in a B and B near Fouras. It was lovely break, not that we need an excuse, but we made the most of it and had a great seafood meal next to the beach. 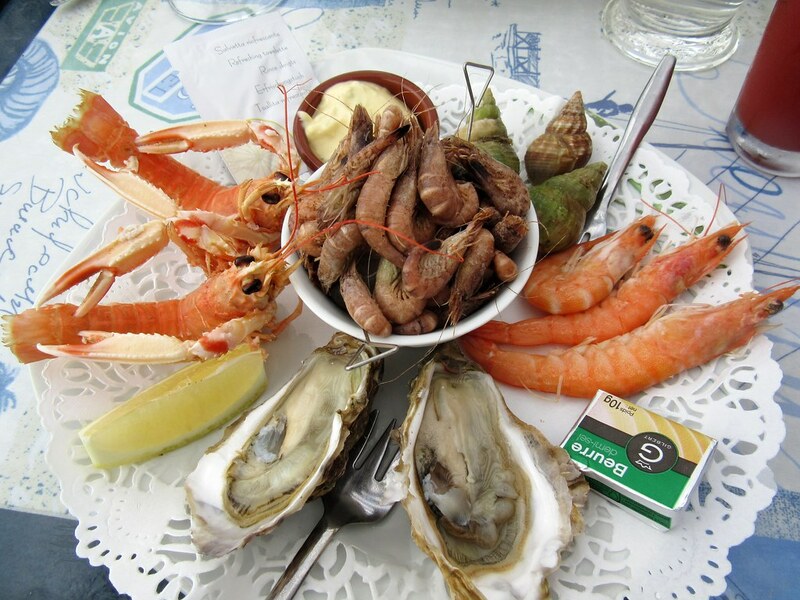 Oysters are big here and advertised everywhere so it was nice to actually sample some. Our place had a pool too, which was a real bonus, as we’ve cycled past loads, which look so inviting in such hot weather. 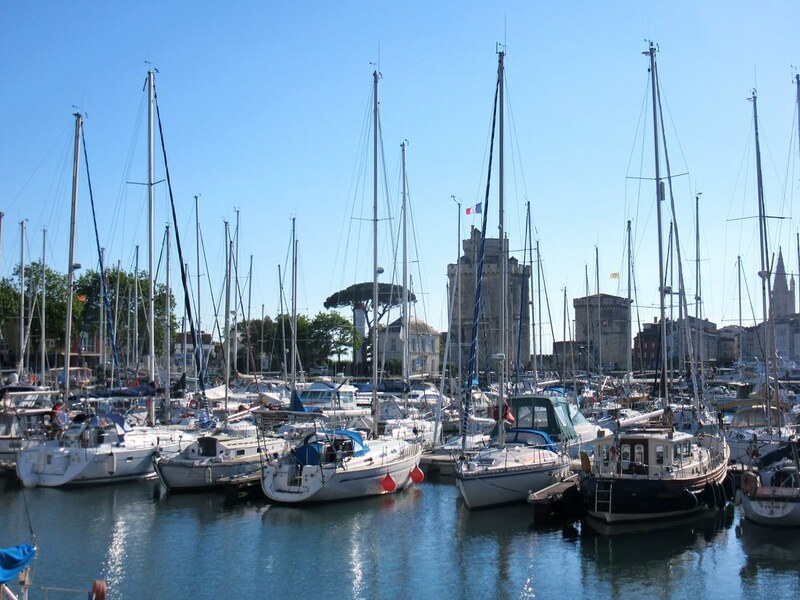 We headed up to La Rochelle from Fouras, picking up the next section of the Velodyssey. 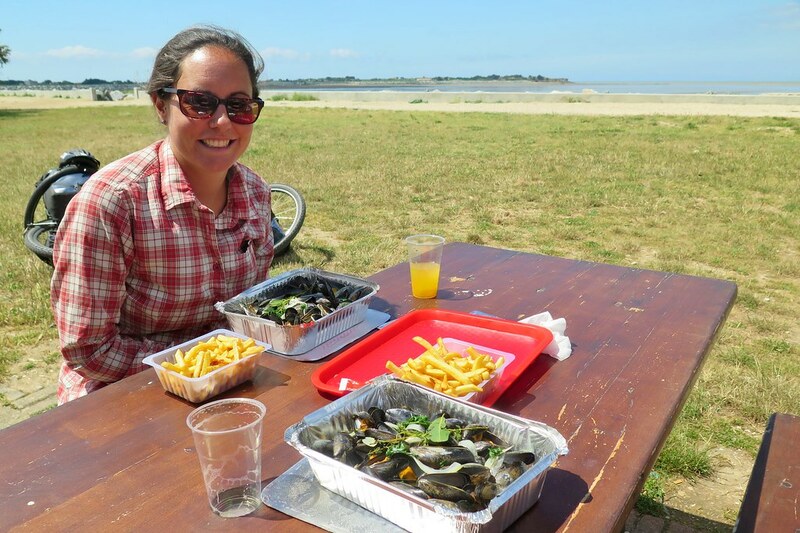 On our way we stopped at a little shack on a beach that was serving moules frites. It was a little early for lunch, but we couldn’t resist! 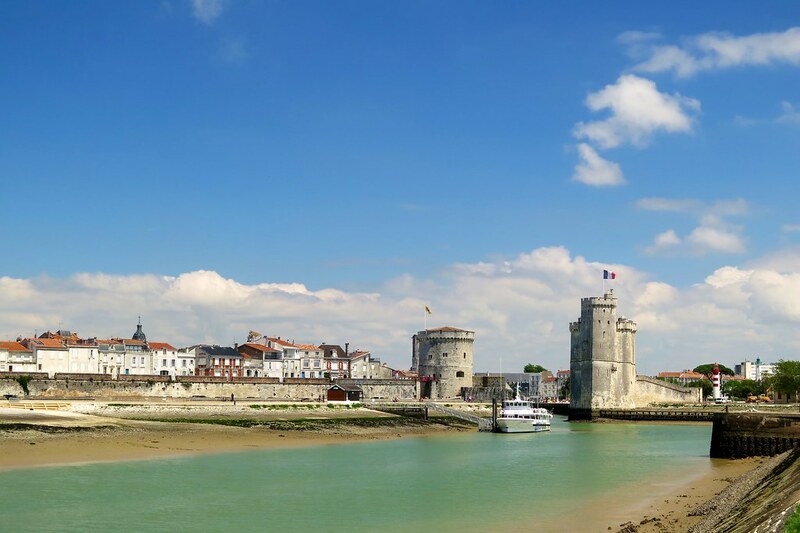 We stopped for a day off in La Rochelle, mainly because it’s a really beautiful port town, but also because I needed to get my rear hub sorted. It’s done nearly 30,000km now and has been wobbly for a while. I took it to a bike shop in Toulouse and they’d opened it up and regreased it as a quick fix, saying it should be enough to get me back to the UK. But it was getting very wobbly again and was starting to creak when I pedalled, so I wanted to solve the problem with a new hub. 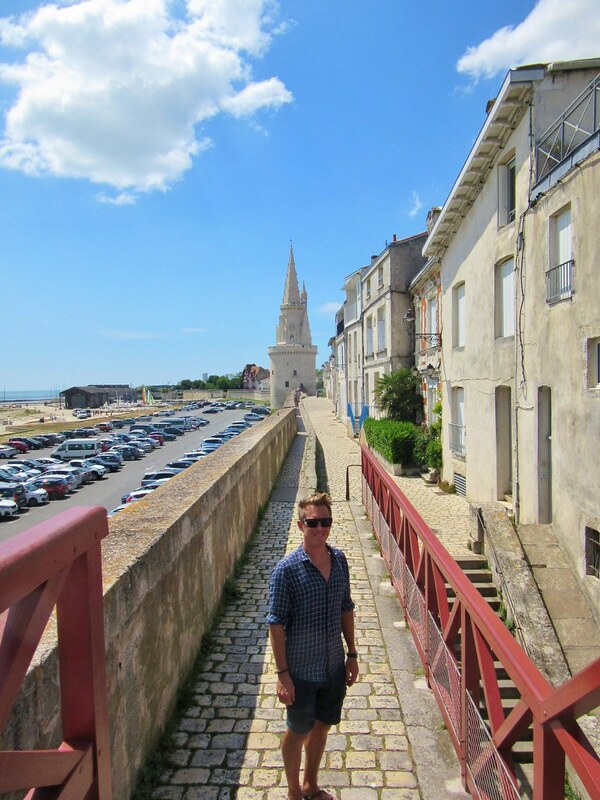 It was nice to be off the bikes for a day to explore on foot, wandering around the old town and harbour with its famous towers. 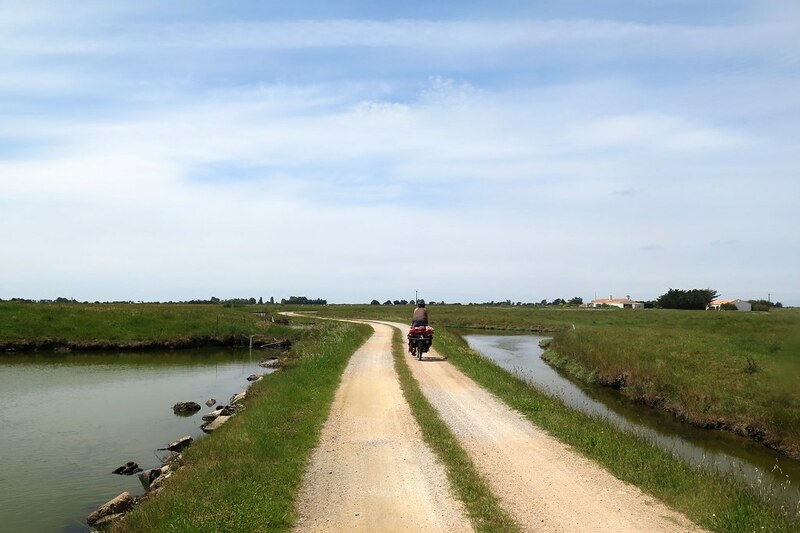 From La Rochelle we rode inland on a main road for another river crossing. 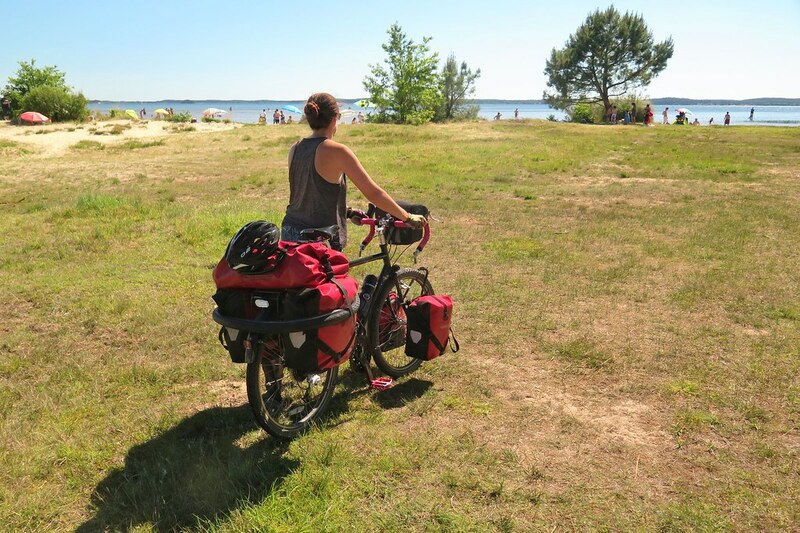 We stopped in a picnic area for lunch and soon after we arrived, another touring cyclist pulled up and said hello. We see a lot of other cyclists with panniers in this area but this guy looked like a real traveller type, with a pretty ghetto bike that he’d pieced together himself from all kinds of mismatched parts. His name was Ulyan, and he’d been on the road for 7 months, having started down in Morocco before the winter. 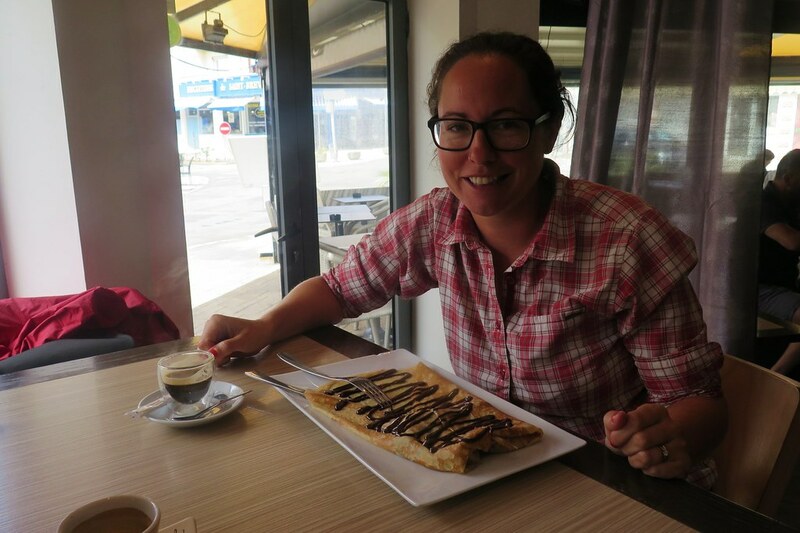 We chatted for a good while in a mix of French and English, comparing stories from the road. 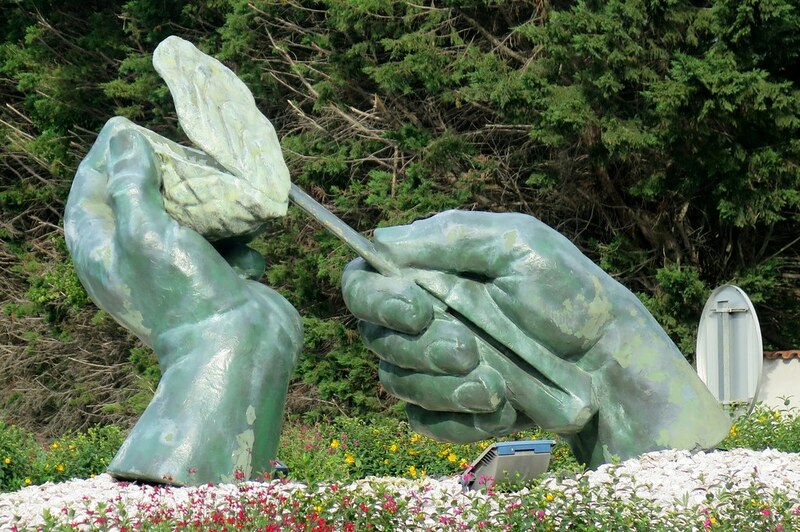 He’s got no real destination in mind, but is heading north, so we may well meet again. 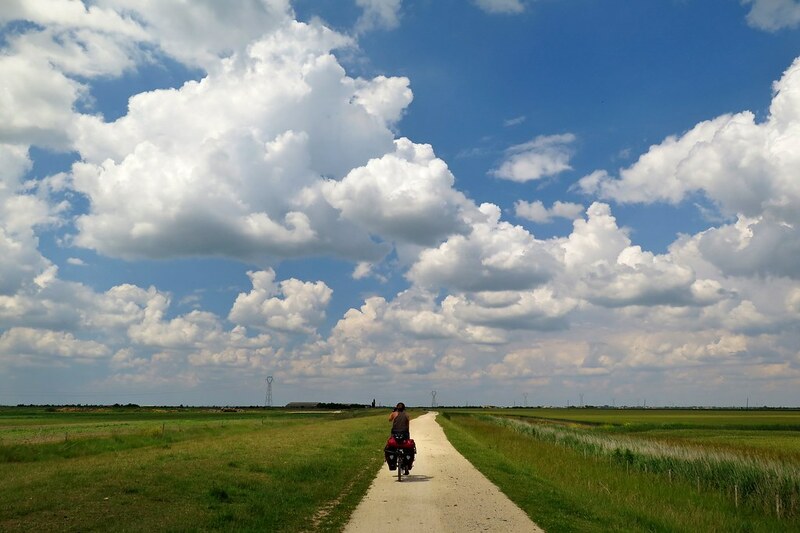 We headed off and once we’d crossed the river were back on to cycle lanes, working our way back to the sea under big blue skies. 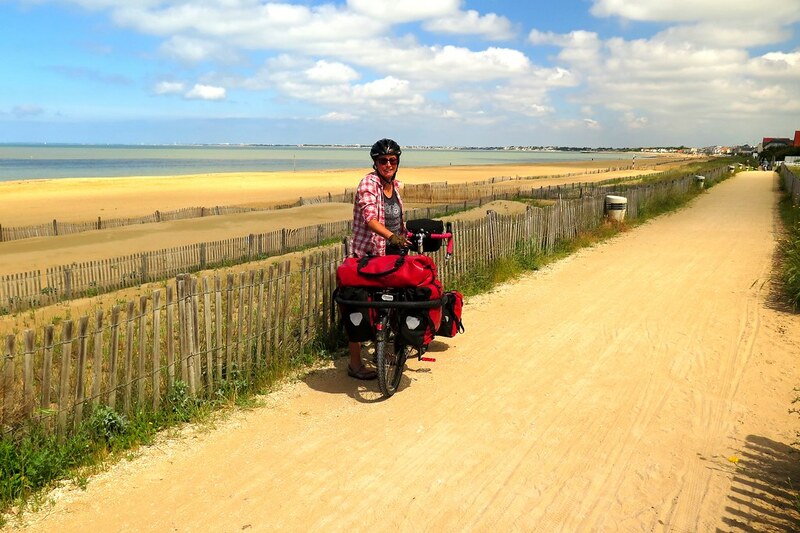 We were back on the coast for the next few days, riding through the Vendee region. 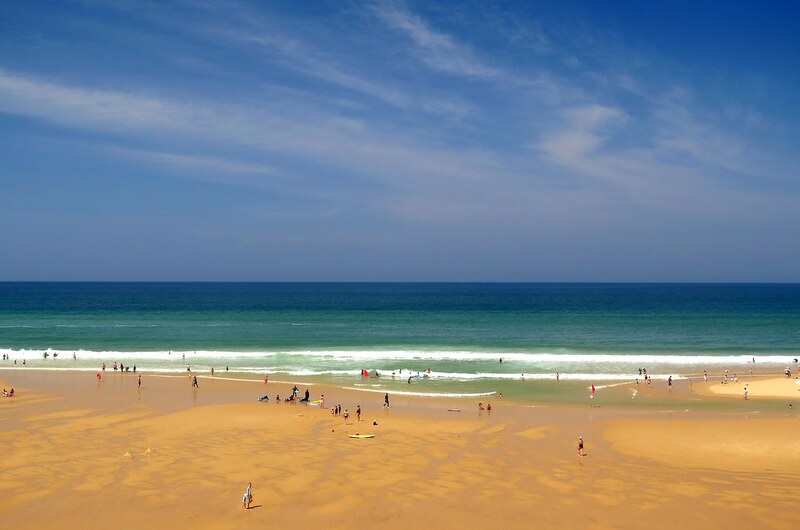 The first day stayed bright and sunny, and we even went swimming in the sea for the first time in a while. 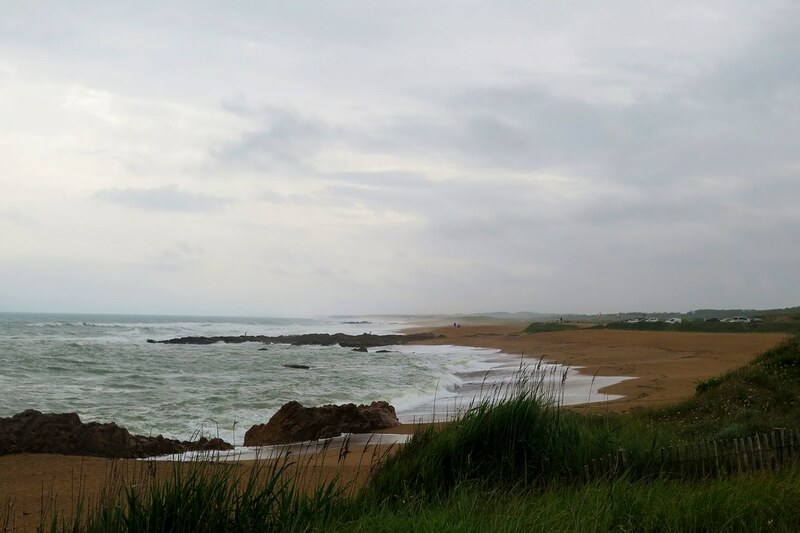 The next day, when we reached Les Sables d’Olonne, famous for the Vendee Globe yacht race, we had grey skies, showers and headwinds. It was hard work in the wind, especially as this section was quite open and next to the coast. Past St Gilles Croix de Vie the weather improved again. 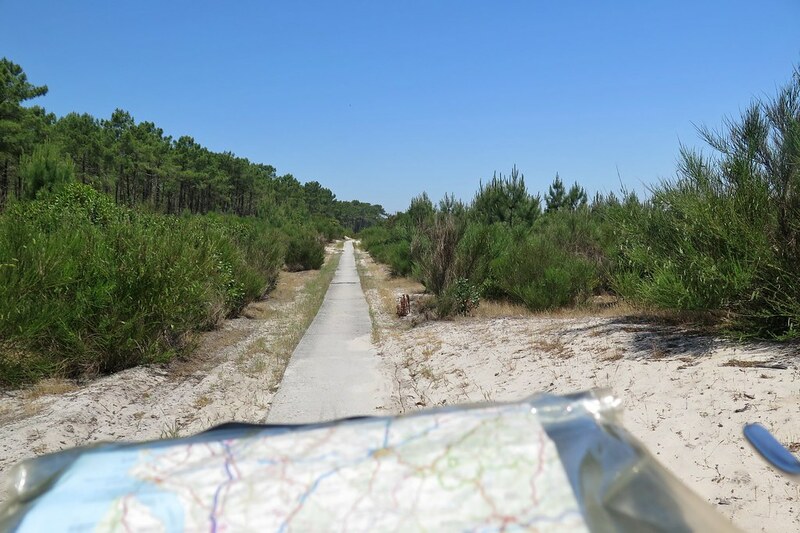 The path again did its thing of zig zagging through the sand dunes and forests in a not particularly direct route, but it was fun riding, our Long Haul Truckers pulling off passable imitations of mountain bikes on the dirt trails. 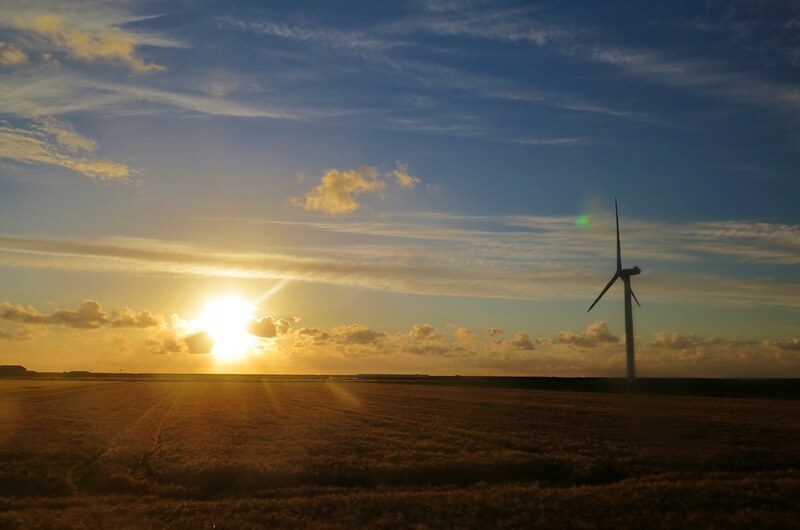 Then we were out into a big open wetland, more big skies overhead and wind turbines all around. 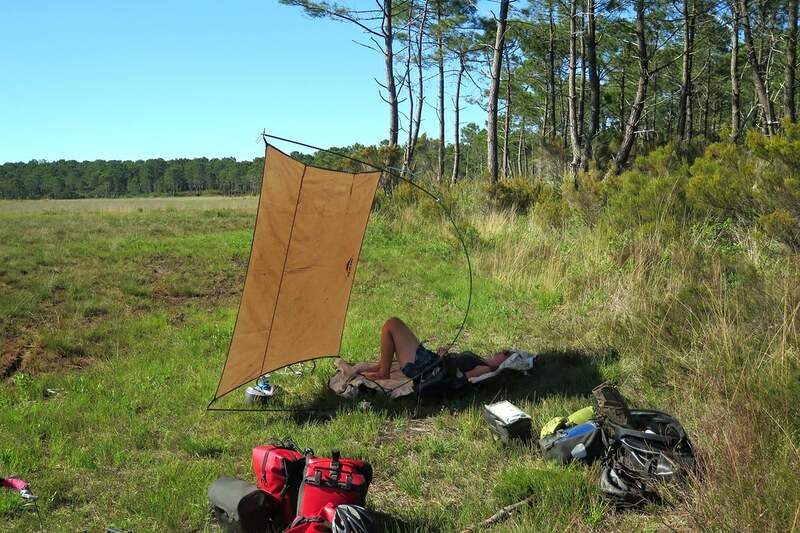 There wasn’t much shelter for wild camping, but we found a decent spot behind a levee to the south of Pornic. 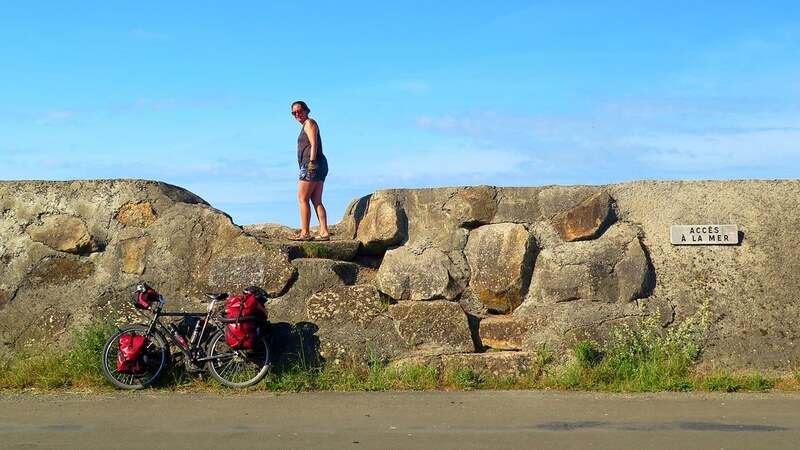 Somewhere along the way, path had changed name, we were still on the Eurovelo 1, but here it was called the ‘Velocean’. Although, apart from a few short stretches, there wasn’t much ocean to be seen. Every signpost seemed to take us towards the low hills back from the coastline. Being the rebels that we are, we strayed away from the signposted route to try our luck on actual roads. It’s nice to be by the sea. 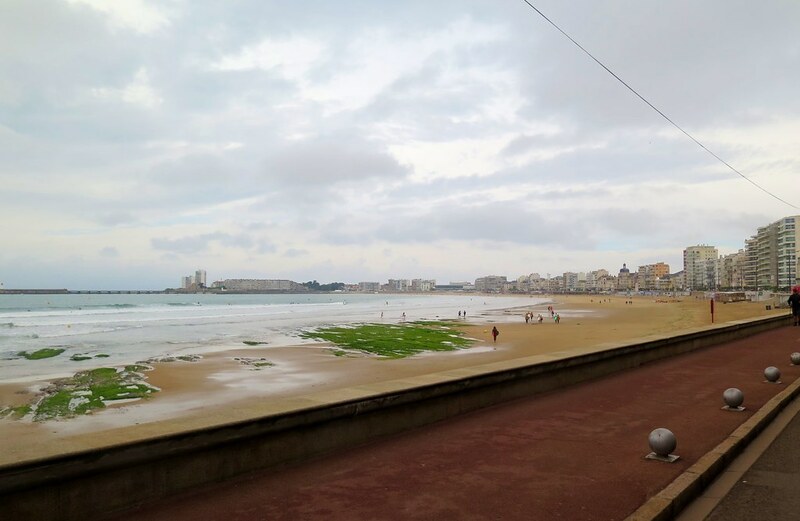 As we got in to Pornic, the clouds were rolling in and the wind was building, especially on the seafront. We rejoined to cycle route which cut inland and by mid afternoon the sky was very dark. There was a big storm in the forecast for that evening, so we decided to call it when we saw a wooded area which would give us a bit of shelter. The tent went up quickly and we retired inside when the first drops started falling. The forecast was accurate, we were pounded with rain and the wind howled through the trees for most of the night. In the morning, the worst of the weather had passed, but we still had strong winds and short sharp downpours between sunny spells. 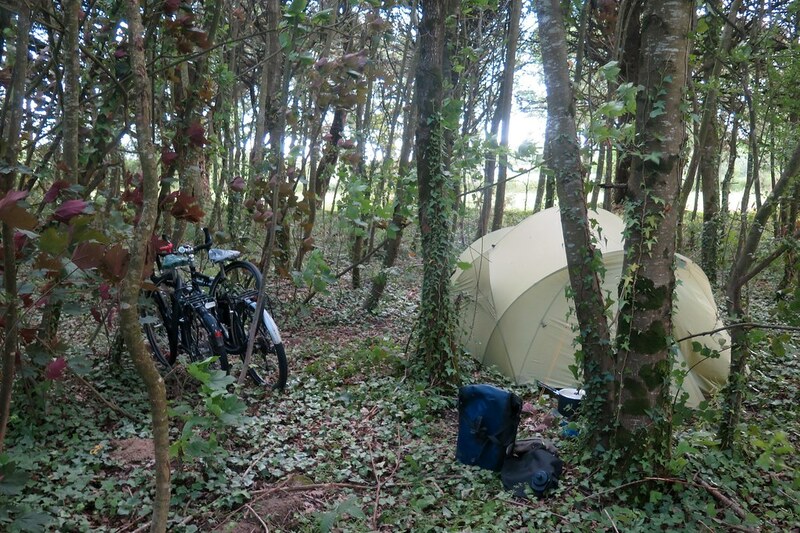 We packed up the tent and rode on towards the Loire wearing our wet weather gear. 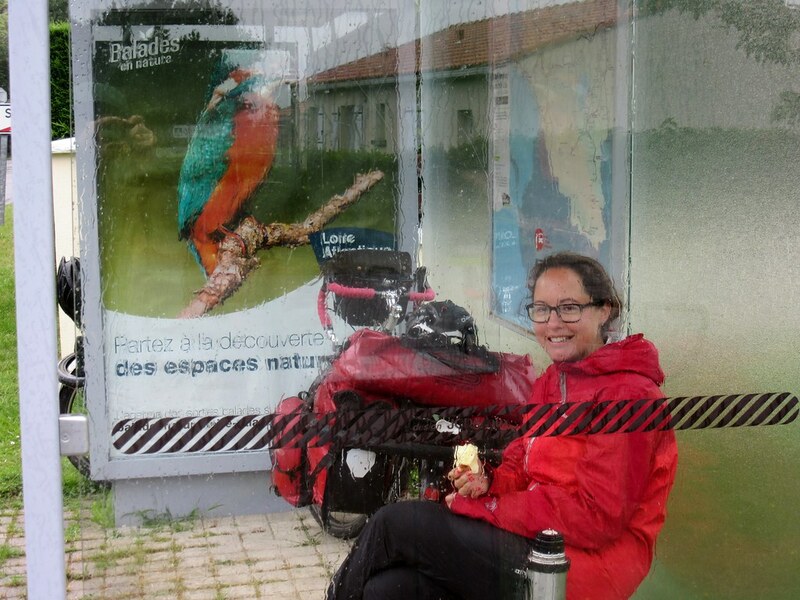 We had a couple of breaks through the morning, once to hide from the rain in a bus shelter, then for a morale boosting crepe. 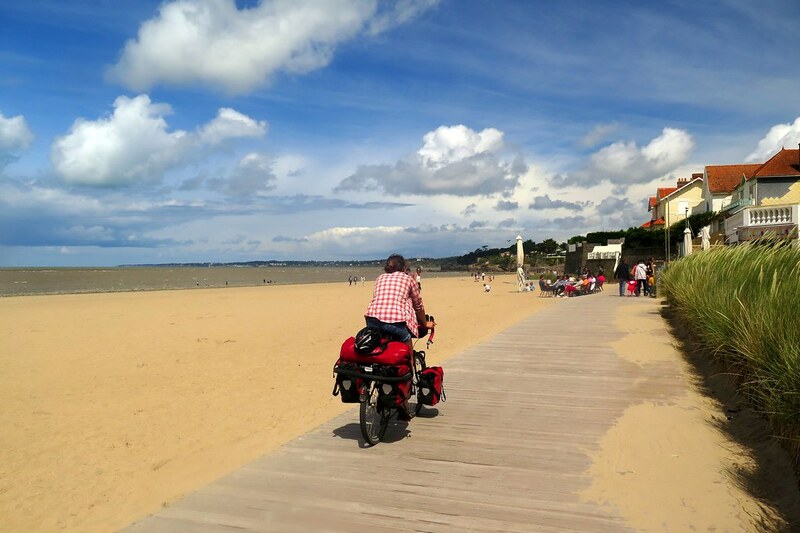 We’d decided to get a hotel room for the night so we were on a mission to get to Saint Nazaire, on the opposite bank of the Loire estuary. 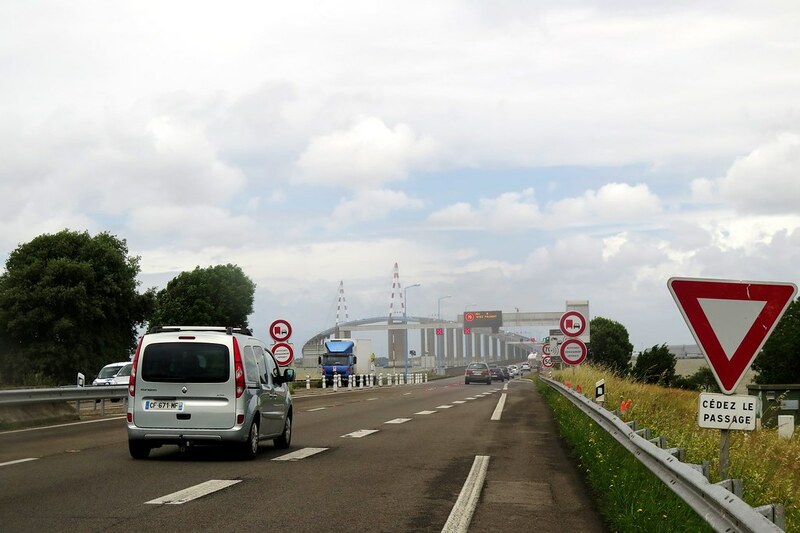 The last obstacle in our way was the 3.3km Saint Nazaire bridge. There is a narrow cycle lane beside the traffic lanes, so we thought we’d have no problems, but once we were a little way out onto the bridge, the sidewinds hit us, making it impossible to ride in a straight line. We had to walk our bikes, it was just too dangerous to ride with the brutal wind blowing us all over the road. It took us a long time to push our heavy bikes up and over the bridge, we had to stop regularly, bracing ourselves against the stronger gusts. One particularly strong gust pushed my handlebars sideways and I somehow knocked my speedo out of its housing. It must’ve been taken over the edge by the wind, so we’re now minus a bike computer. Luckily we keep a record of our distance each day, so we can still keep our total mileage up to date for the trip with a newly purchased cheapy supermarket speedo. 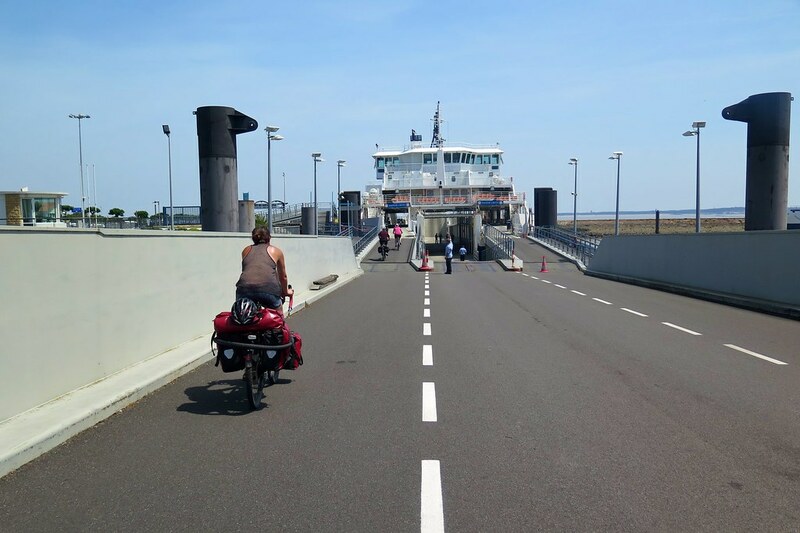 Slightly rattled from the bridge crossing, we took the first exit from the main road and rode hard for the last few kilometers into St Nazaire and into a hotel to dry out and relax for a night.